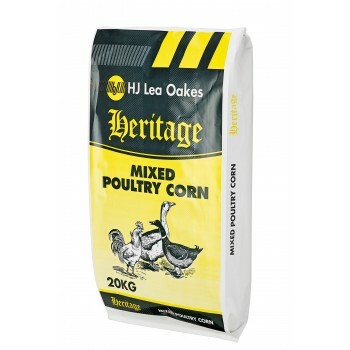 Our range of poultry health products are designed to treat ailments such as Scaly Leg and Feather Pecking and nutritional products including Grits and Liquid Tonics to maintain a healthy diet for your chickens. 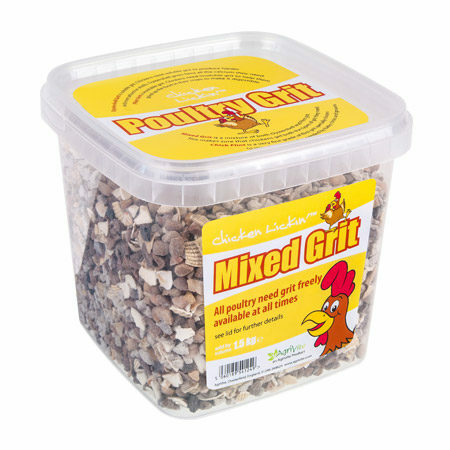 Mixed soluble and insoluble grit. 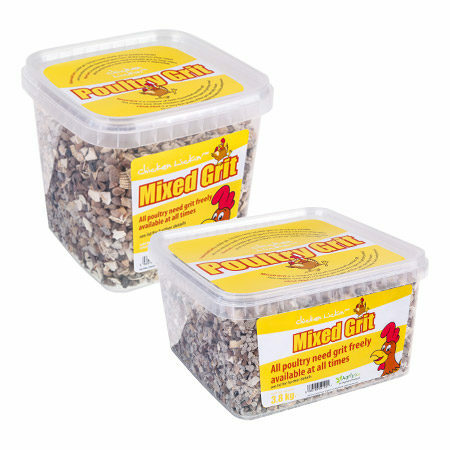 The best choice for those who don’t want to offer separate grits. Helps prevent biting, plucking and canaibalism. It contains a foul-tasting substance with a very strong ordour and most biting or plucking should cease after 1 – 2 days. 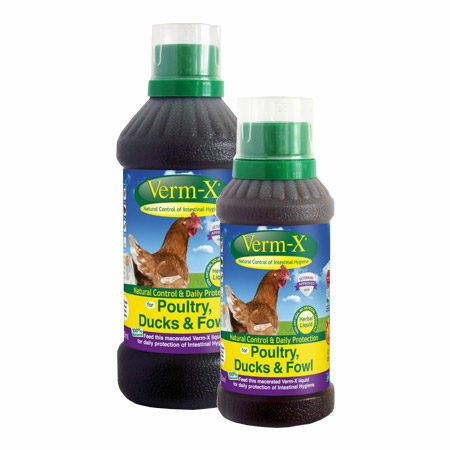 Nettex Anti-Feather Pecking Spray also includes anti-bacterial agents that will help disinfect minor skin abrasions. These agents also help minimise the spread of bacterial infections and help support the healing process. Spary on to any affected areas including skin where feathers have been removed. Use on feathers should be avoided. 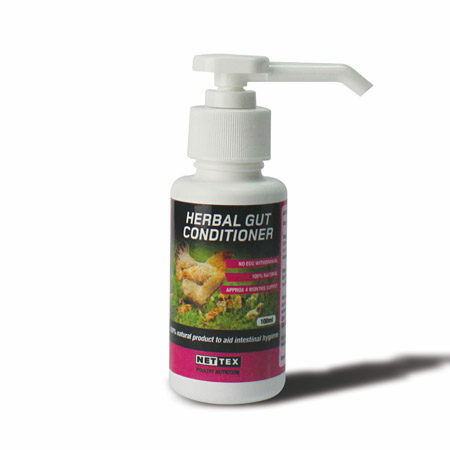 A 100% natural formulation to help support gut hygiene and the digestive system. 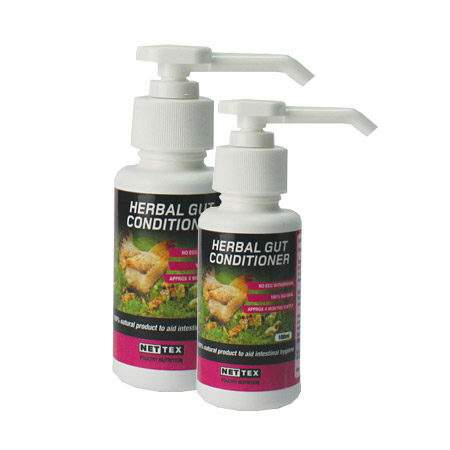 Add 1ml (1 pump) of Herbal Gut Conditioner to 50ml of fresh drinking water per bird for 3 consecutive days per month. The quantity of fresh water available should be less then usual to ensure consumption. 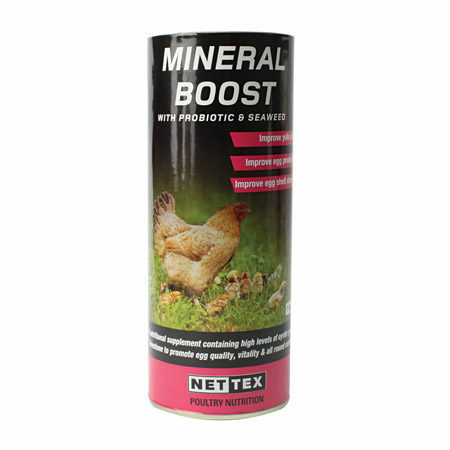 Nettex Poultry Mineral Boost with Probiotics and Seaweed is a nutritional feed for laying hens containing high levels of limestone and oyster grit to assist digestion and support shell quality. 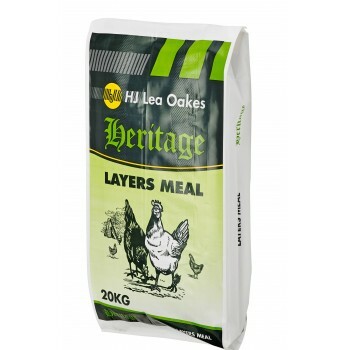 Add Mineral Boost to feed twice a week to support optimum health. 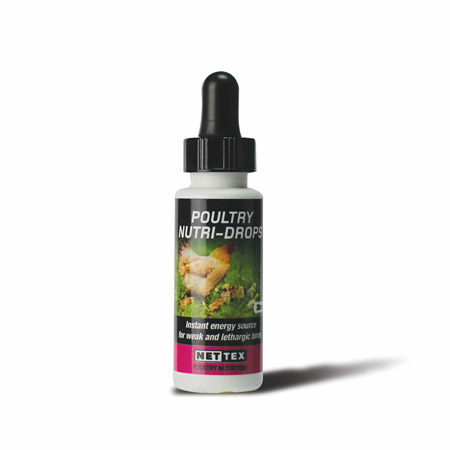 Nettex Poultry Nuti-Drops is a fast acting pick-me-up packed full of vitamins and minerals, including extra B vitamins, to help support birds in stressful situations. The support is rapid and noticeable. 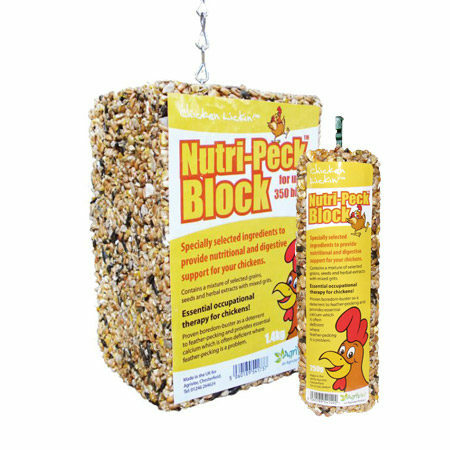 Instant energy source for weak birds – energy levels may improve in as little as 30 minutes. 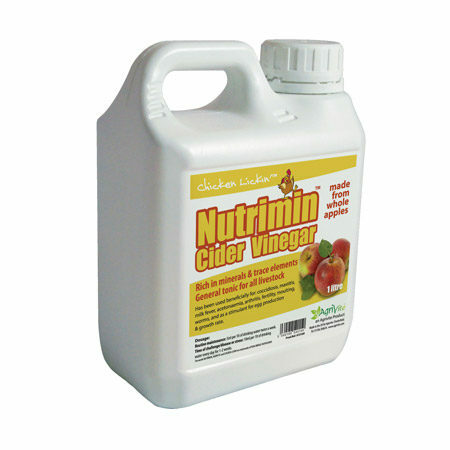 Provides immune supporting vitamins during periods of environmental stress, e.g. when feed intake is depressed at high temperatures. Helps support peak egg production at times when maximum stamina and energy are required. 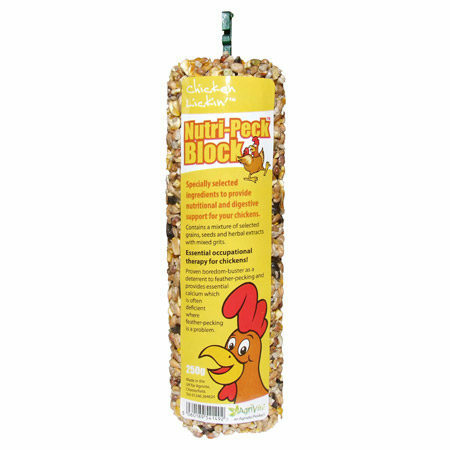 Helps support the bird during periods of stress, such as during vaccination, handling and following antibiotic treatment when feed absorption can be disrupted. Helps support appetite and feed efficiency. Aids in the preparation for onset of lay. Consider using when introducing a new bird to an established flock, as this is a very stressful experience for a bird. 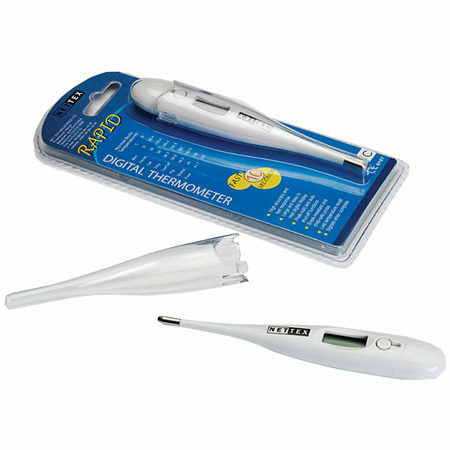 Administer 1ml per 1kg of body weight (average weight of an adult bird is 2.5kg) directly into the mouth of the bird for a minimum of 3 days. Use for up to a period of 5 days. 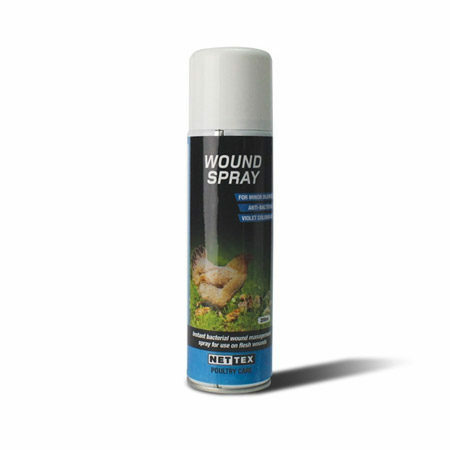 A highly effective, powerful anti-bacterial wound cleansing aerosol spray. Specifically formulated for application to minor external wounds, grazes or in skin punctures requiring immediate attention. When applied a violet residue is left, indicating the affected area has been covered. The residue also helps disguise the appearance of any blood to help prevent bullying and pecking. Simply spray over the affected area. 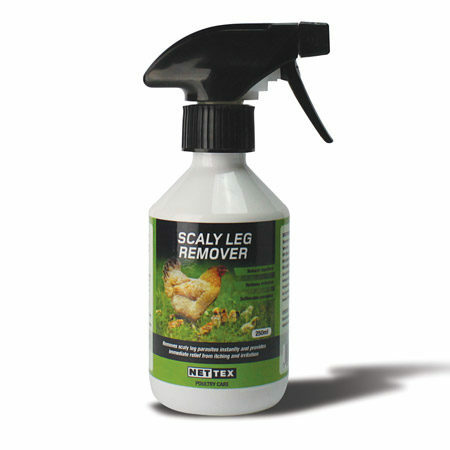 A specifically blended formulation designed to eliminate and effectively control the scaly leg parasite in one simple spray application. 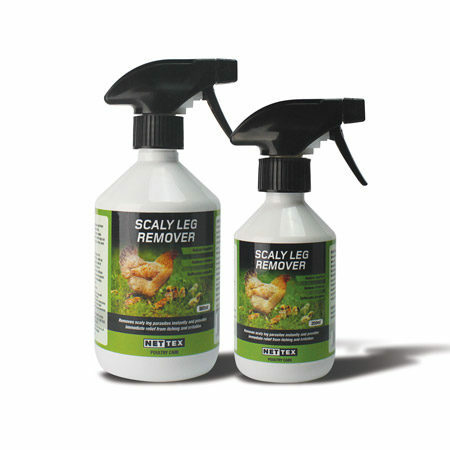 Spray directly onto the legs, feet, comb and wattles to treat infested areas. Repeat every 5 – 6 days to break the egg cycle until the infestation has gone. 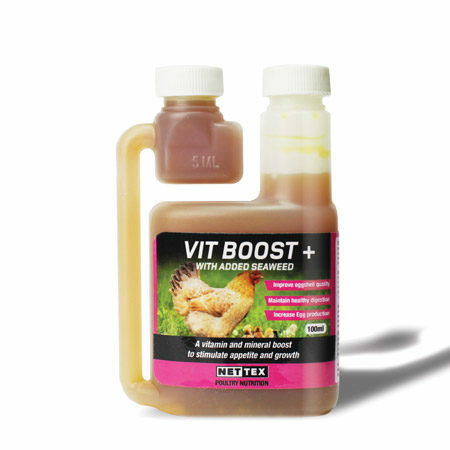 Nettex Vit Boost + with Seaweed supplies essential vitamins and minerals through drinking water to help support bird health and vitality all year round. 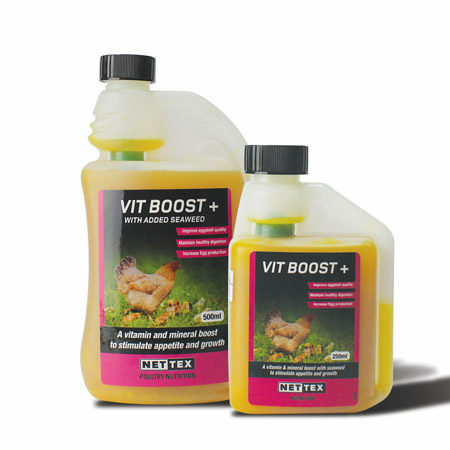 Add Vitamin Boost+ to your bird’s water at 5ml per 4.5L of water. During periods of nutritional stress, add 5ml to 1L of drinking water. Make a fresh solution daily. 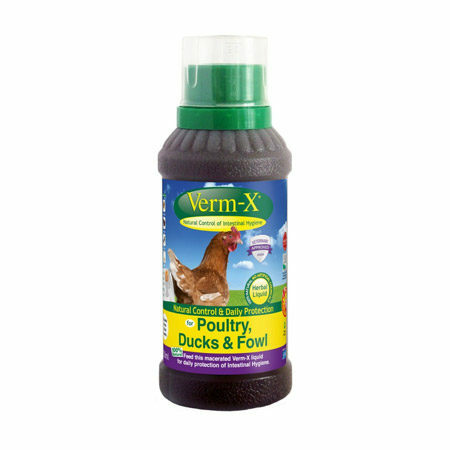 Verm-X for Poultry has the added advantage that you are able to eat your hens’ eggs whilst using the product. 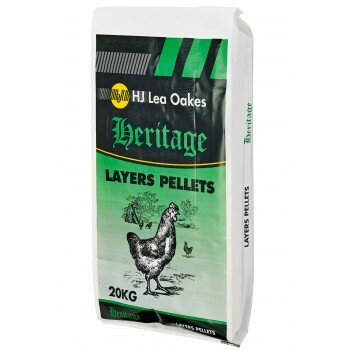 Approved for use in organic systems following assessment by Organic Farmers and Growers Ltd. The liquid formulation is added to drinking water or can be soaked into bread and fed directly. 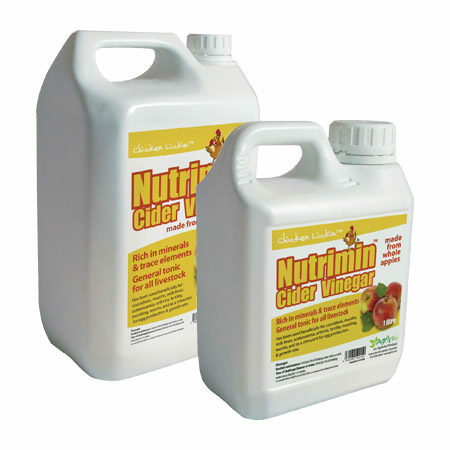 Add 1.5ml per bird to their daily drinking water ration or soak in bread. Repeat for three consecutive days every month.